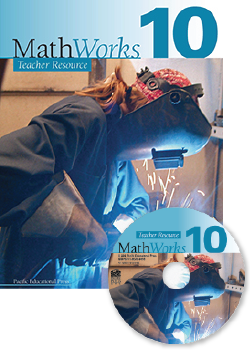 This package includes the printed MathWorks 10 Teacher Resource and a CD containing a PDF of the text, including printable line masters. This resource supports the use of the MathWorks 10 Student Resource to deliver the learning outcomes of the Western and Northern Canadian Protocol (WNCP) Workplace and Apprenticeship Mathematics program. Errata: The original printing of MathWorks 10 Teacher Resource contained the errors found in this document (PDF). We apologize for any inconvenience this may have caused. These errors will be corrected in future printings of the resources.